Ah, Ambrym. The reason why I went to Vanuatu in the first place. 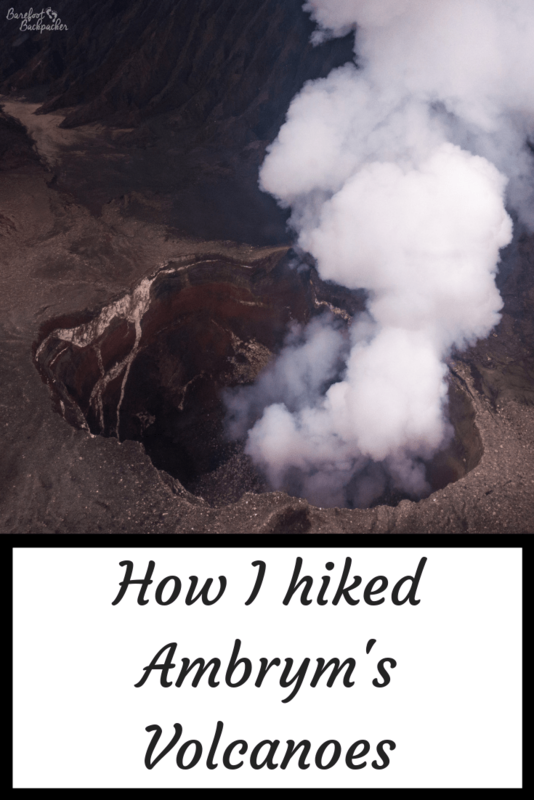 Because while there are more accessible and spectacular volcanoes even in Vanuatu (Mt Yasur on Tanna Island springs to mind), I wanted a more spectacular hike, plus the thought of being able to camp overnight in the volcanic hinterland definitely appealed. 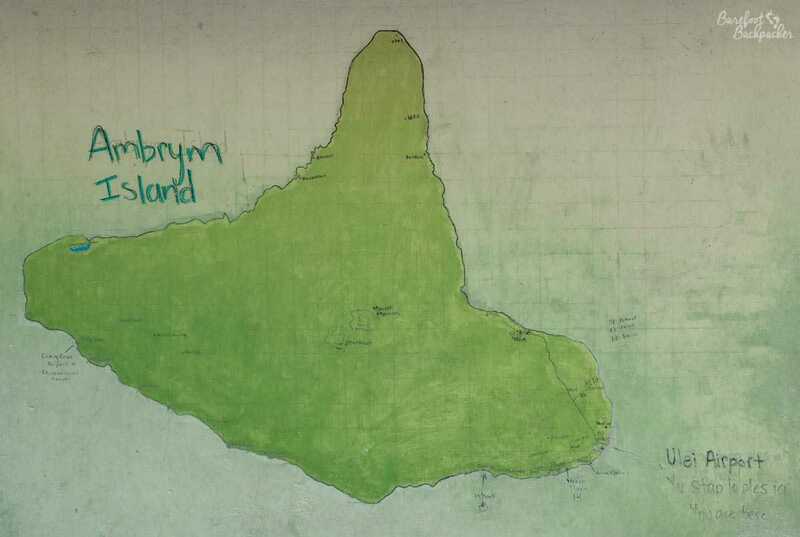 Map of Ambrym, as seen at Ulei Airport. Craig Cove is on the left; Port Vato is five villages down the coast from it. The island isn’t terribly big – around 680 km², or slightly larger than the fake former UK county of Merseyside. It’s dominated by not one but two volcanoes in the centre: Mount Benbow lying slightly further to the west than Mount Marum. 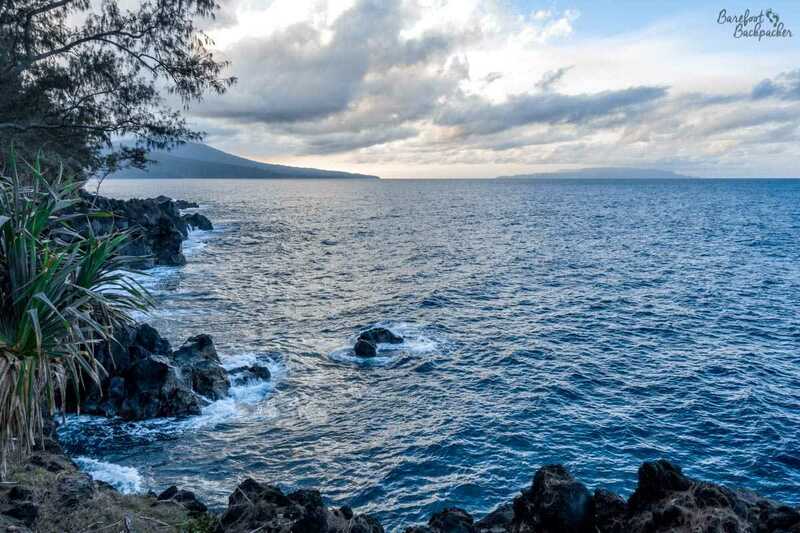 There’s not a great deal else on the island in fact; interestingly there are no rivers, so while the small villages collect water from the rain, they don’t advise foreigners to drink it due to its high acidic and mineral content from the volcanic ash and steam. Oh yes, these are active volcanoes; the last eruption was an ongoing one from Mount Marum throughout much of the early 2000s – indeed they’re considered amongst the most active volcanoes in the world and are constantly monitored. Craig Cove Airport, with my flight just having landed. Part of ‘Sam’s Gueshouse’ where I stayed for two nights near Craig Cove Airport. Most of the houses in the area were in the trees like this. Getting to the volcanoes is an effort. The main port of entry onto the island is at the village of Craig Cove, at the far west of the island, which is nothing much more than a series of small cottages partly hidden in the forest, with a small harbour and a shop a couple of km away. 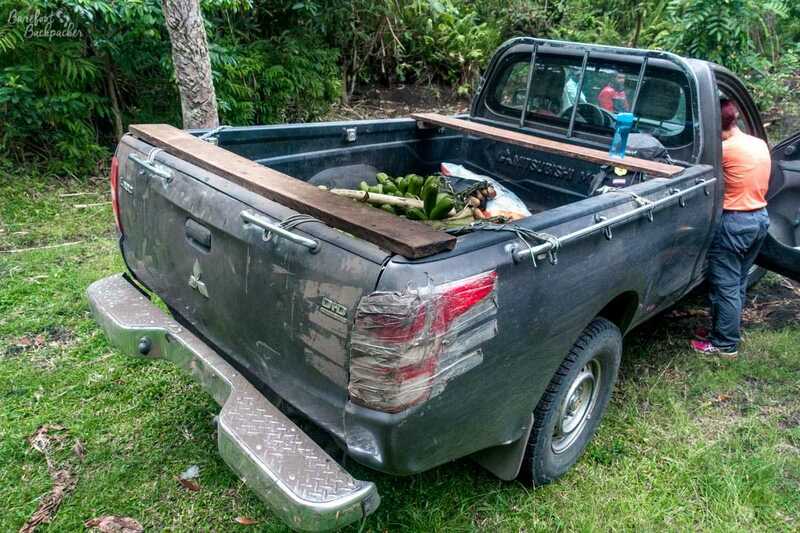 You then need to hitch a ride on a 4×4 along the coast for a couple of hours to the village of Port Vato (about 6,000 Vatu – it helps to go with other travellers! ), where you start the trek through the jungle up to the ash plain and the main campsite. The 4×4 truck that took us to the start of the trek. Two hours long bumpy roads, and we started in the dark too! The trek up took me 2hrs 40min, but note that I hike like a man possessed. 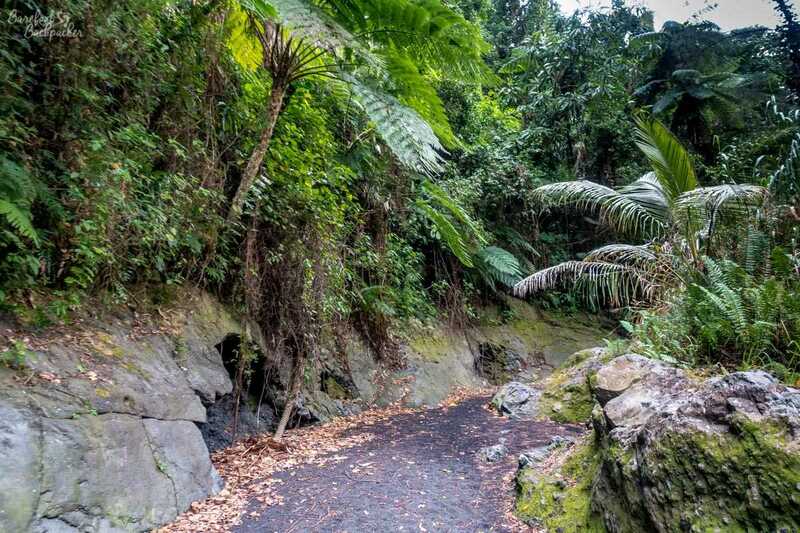 There are two sections to the hike – the first goes along an old river or lava bed and is quite rocky, but at least it’s short scrambling rather than the long uphill drags along narrow footpaths through the jungle which dominate the second section. Well, I make it sound like it was easy, but me being me, bad balance and all, I managed to slip off one of the rocks and fall a couple of meters down the slope. Cue much embarrassment on my part – the only lasting damage being a sore bottom/lower back that caused me to be a bit more careful with my hikings later. This is the early part of the trail up to the volcanoes; note it looks like a dry river bed. 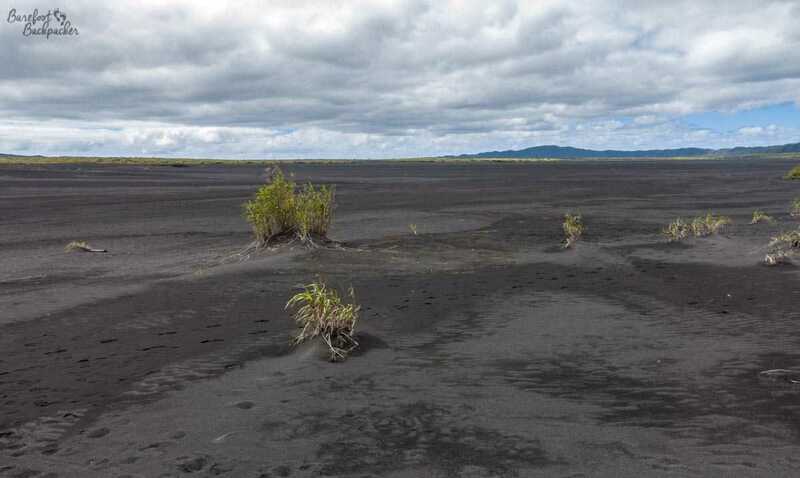 The area around the volcanoes is a huge ash plain. This covers around 100 km² of the island, relatively flat, and is a great contrast to the hilly jungles around the coast. The main features are what on first glance appear to be dried up river beds but are really the tracks of lava flows from previous eruptions. The ash itself is black and very soft, almost like the fine black sand seen on many of the beaches across the country. Apart from the occasional hardy bush and weed, the whole area feels very dead. Certainly it’s very quiet – there are distant birds that can be heard in the jungles below, but apart from the wind, pretty much you make the only sounds. 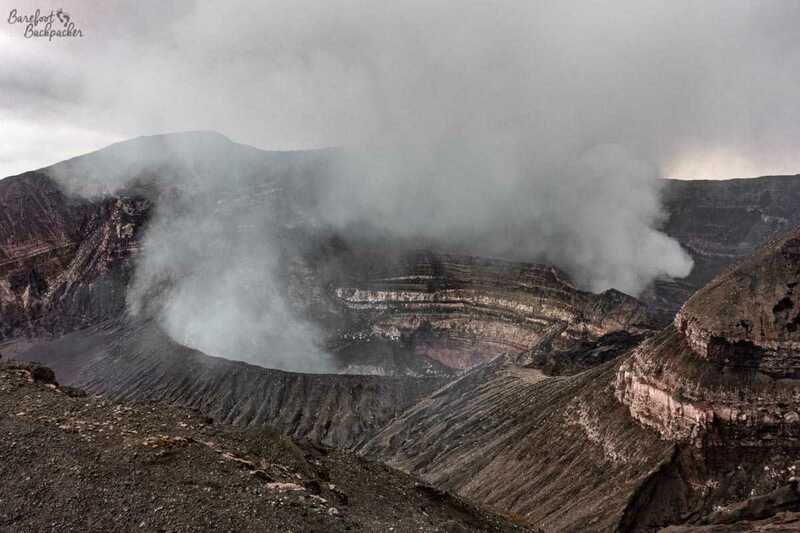 Although obviously affected by every volcanic eruption from both volcanoes, it’s believed the size of the ash plain was defined one of the largest volcanic eruptions in recorded history, just under 2,000 years ago. The ash plain on Ambrym. It’s mostly flat and black, with some small grasses clingin on. 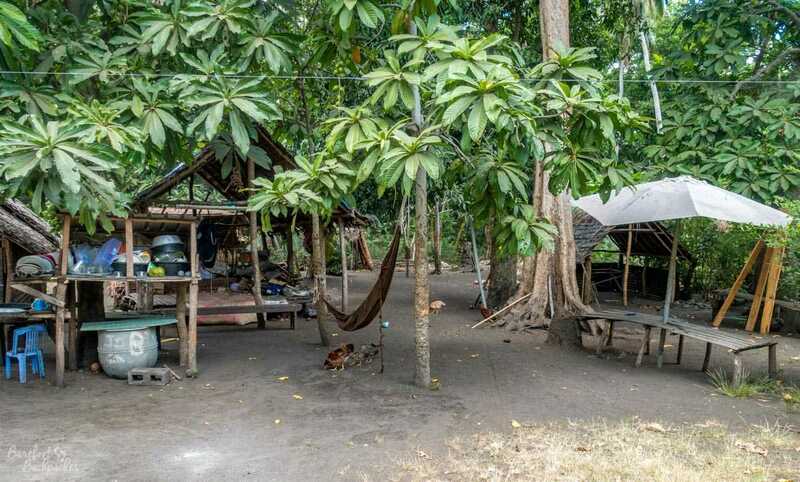 I stayed two nights in the campsite just off the ash plain, in a little cutting in the jungle where the path across the island flattens out. 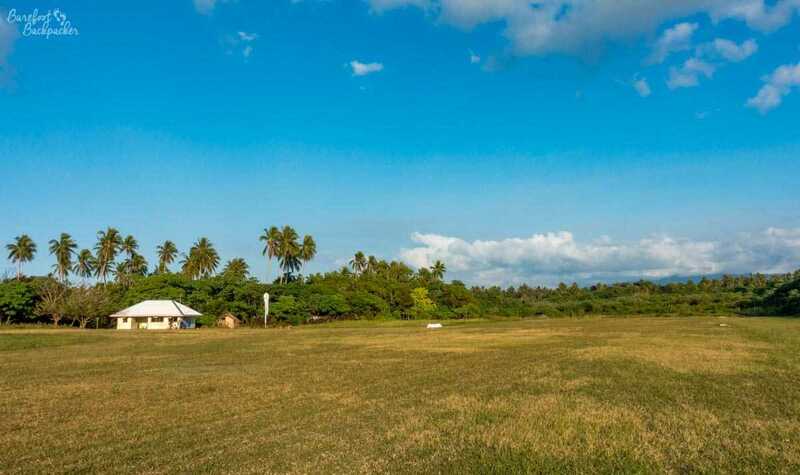 It’s pretty basic facilities – apart from the wooden framework that defines the social/dining area, pretty much everything has to be brought up from the coastal villages. This includes food, water, tents … there are no facilities at all on site. There is a drop-toilet in a cabin a short walk into the trees, otherwise its very much going ‘into the bush’. Food was pretty much exactly what you’d have expected; hot water to drink and dried noodles or rice to eat. As a solo traveller I felt a little bit lonely here; this was partly due to the larger-than-I-would-have-expected number of local guides and hangers-on lurking around the site (I had one guide) all speaking Bislama or French to each other, but they did surprisingly head off to bed quite early so it wasn’t something that kept me worrying all evening. Inside the camp site, as the many guides/locals milled around. 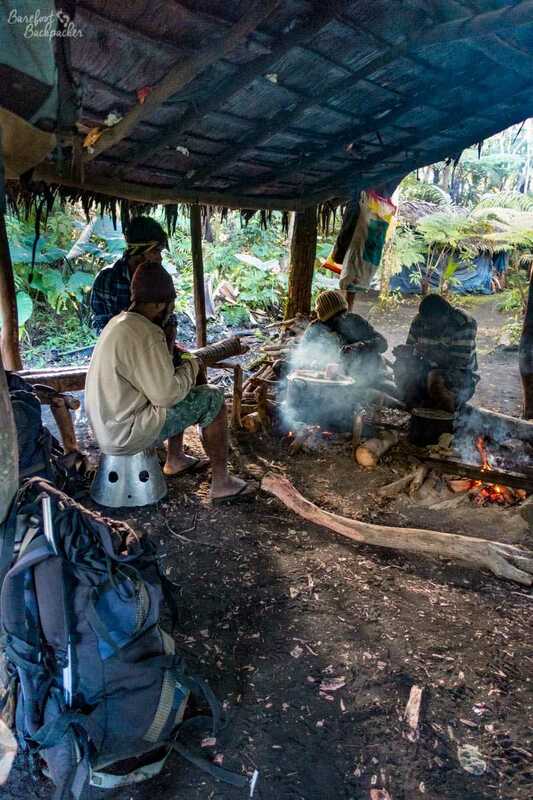 On the day we arrived at camp, we had a rest for lunch before heading across the ash plain for an hour to Mount Benbow. 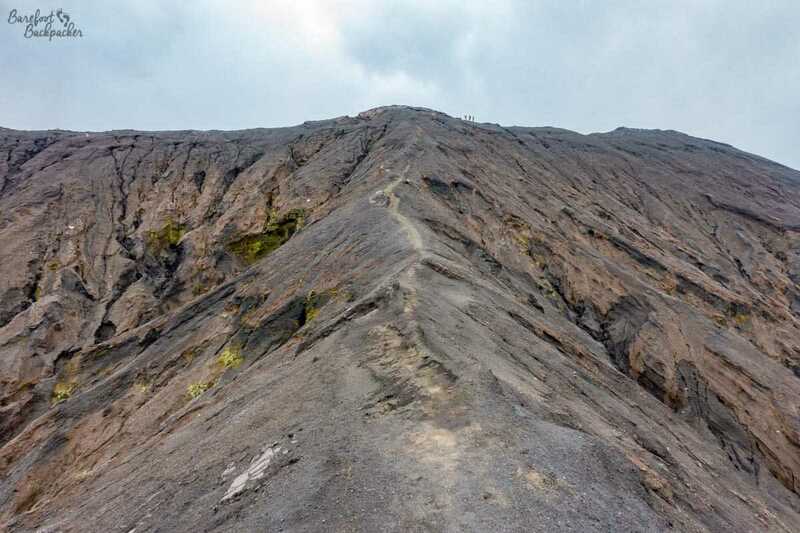 This was the harder of the two volcanoes to reach, as the hike was more technically awkward – the trail headed up a steep path to a ridge high above the crater which was no more than a meter wide, with quite sharp drops either side. The trail up Mt Benbow. I did not look to the side, nor up, and concentrated purely on my footsteps. On the way down, because I have issues with going down (hills! ), I ended up having to hold the guide’s hand, much to my chagrin. In addition, due to a combination of the injury I’d sustained on the way up that morning, and my fear of heights, I never made it to the crater rim itself of the volcano – from the ridge the path wound its way down a sharp descent the other side before reaching the rim and I didn’t feel comfortable doing such a steep trek twice. That said, my decision was made partly because I knew there was another volcano with an easier trek to it so I knew I wouldn’t be missing out. The view from the ridge was pretty awesome though. It was quite windy up there, and on my visit a famous German photographer called Michael Martin was doing a vidclip on the volcano. We stayed up there for an hour or so. Looking down at Mt Benbow from the top of the ridge. The ridge atop Mt Benbow. 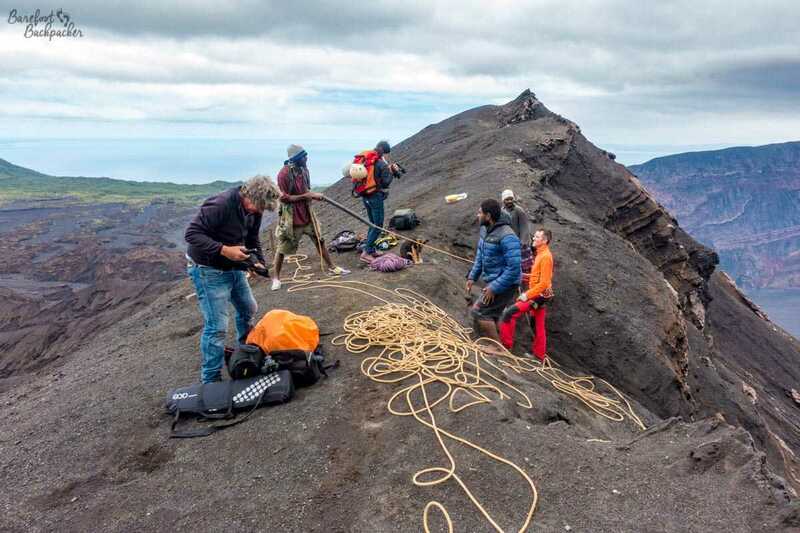 These are the guides & production crew for Michael Martin (centre left foreground) demonstrating how to go down a volcano on a rope. 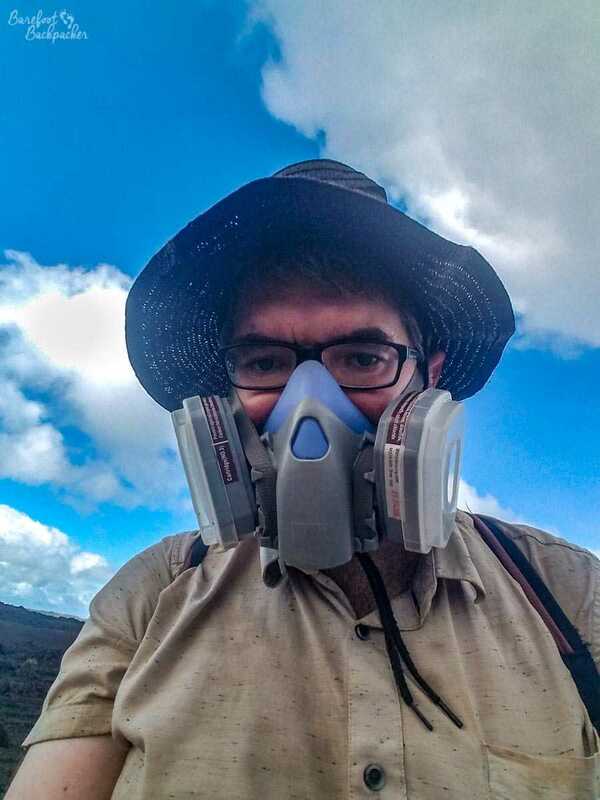 The next day we visited Mount Marum; slightly further away and the trail passed through areas on the plain that were covered in volcanic gases – I was even supplied with a gas mask that made me look like one of the minions in Blake’s Seven. The trail worked past the site of previous eruptions and eventually up to the crater rim; although narrow in places and with short steep sections, it was nowhere near as intense as the trail to Mount Benbow; I didn’t have to take the guide’s hand even once. On the trail to Mt Marum. This is apparently the site of the largest explosion in recent times, in the early 1900s. 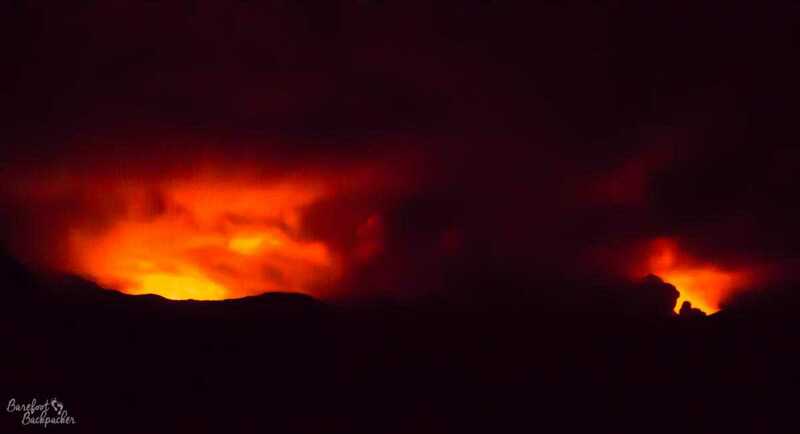 Both volcanoes have visible lava pools, which makes them unusual amongst world volcanoes; there’s not many where you can peer directly into the lakes of Hell. 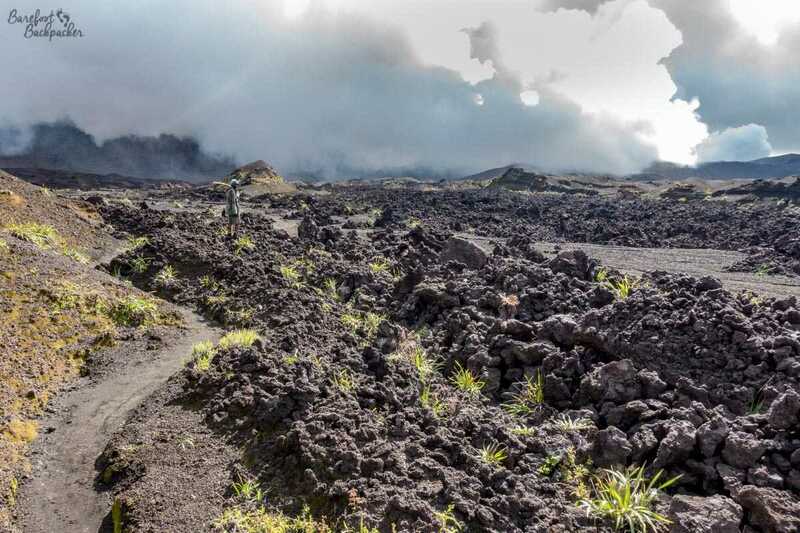 The crater at Marum is pretty huge and there’s a lot of steam coming off it, but if you stand in the right place you can get a clear view of the lava pool. Otherwise it’s a case of wandering around the dead rocky rim and looking out over the sheer cliffs down. It does feel quite weird to know you’re so close to something so powerful, and so deadly; even though the lava pool itself is small, just that it’s there at all makes it feel so impressive and over-awing. 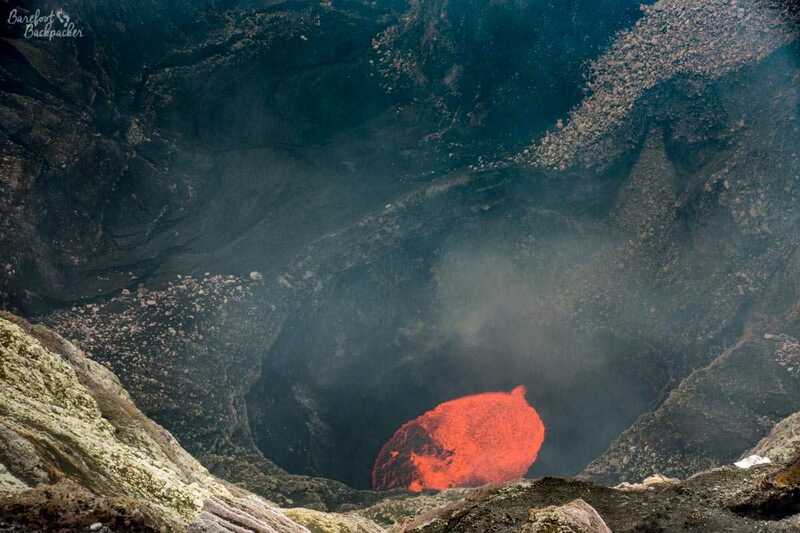 The lava pool deep within the crater at Mt Marum. This was as close as I was going to the edge! 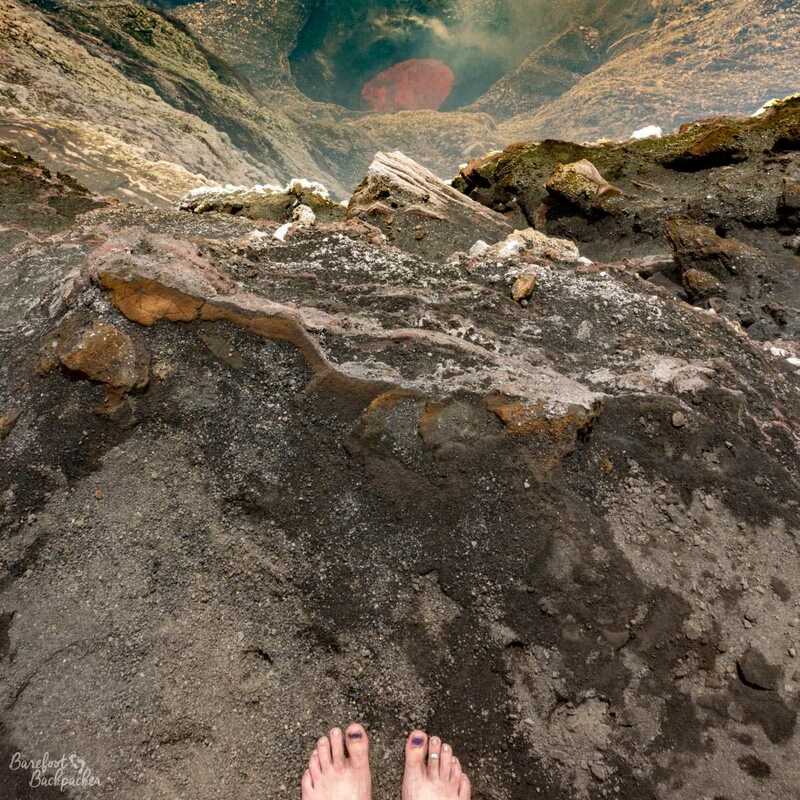 And no, I didn’t hike up the volcano barefoot; that would have been inefficient! The rock edge at Mt Marum’s crater. See the steam rising? The majority of people hike up and down the same way – from Port Vato – indeed some just come for a day trip, although I’d say that would make for a very tiring adventure, plus I think there’s something quite mystical about being on the ash plain at night and looking out at the volcanoes. The two volcanoes as seen on a clear night from the ash plain. Benbow is on the left. I chose to hike across the island, to the village of Endu on the eastern side. The trek down from the campsite to the sea is longer than the trek up (it took me 3hr 45; my guide said ‘most white people take almost six’) but the first half of it is over the vast expanse of the ash plain and therefore relatively flat & quick. That being said, the relief on reaching the ocean was palpable – not least because by this stage I’d finally run out of water. It wasn’t just the end of this trek either; it marked the effective end of my Vanuatan adventure – I only had another 48 hours on the islands and none of it was going to be exhausting. The end of the trek; Endu beach. 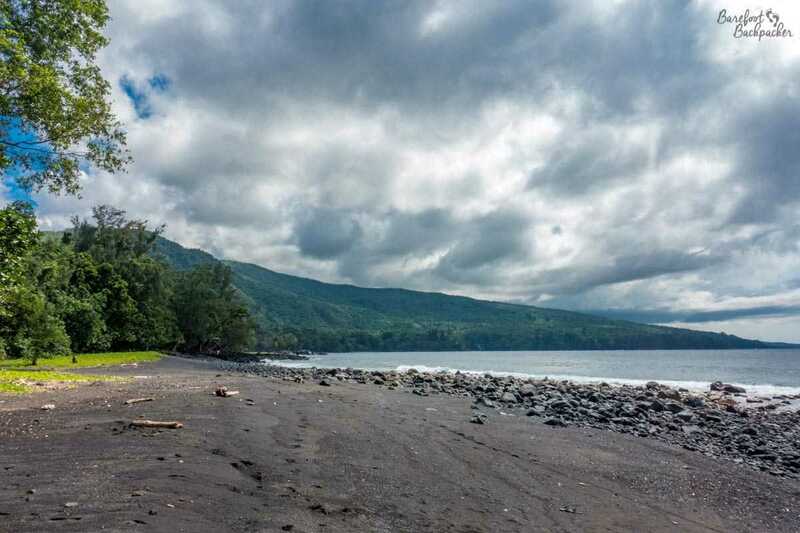 Black sand, obviously. It was a further hour’s hike along farm roads in the jungle to the village, which for an outlying Vanuatan island was a pretty large one, although it seems that everyone visiting ends up staying at the same ‘bungalow’ in the centre, which as usual will provide evening meal and breakfast. After three days without seeing any water, standing at the cliff edge watching the waves crash against the shore was strangely cathartic, but walking to/from the shore was about the limit of my exploration as I was pretty knackered. The seafront at Endu village. In the distance on the right is the southern tip of Pentecost Island. From here it’s another long 4×4 transfer down bumpy roads to the local airport at Ulei. 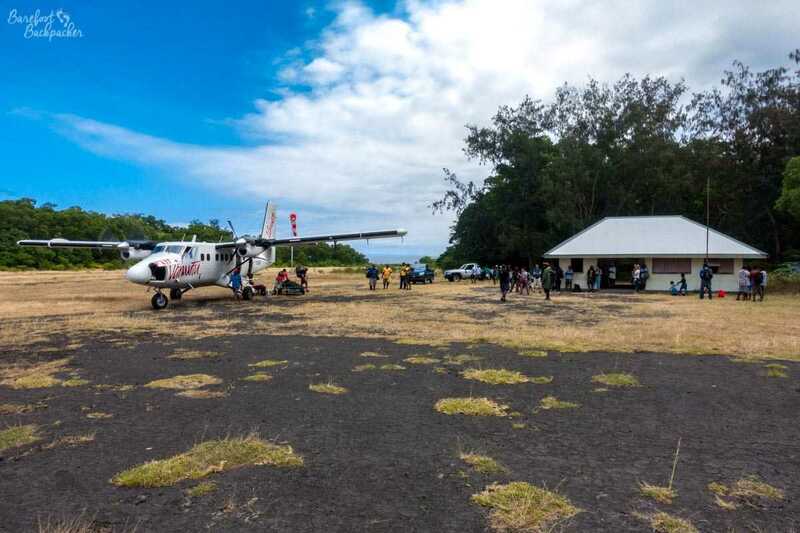 It’s served by only two flights a week; a stopping service between Port-Vila and Luganville that runs to Port-Vila on Tuesdays and Luganville on Sundays, via Craig Cove and the island of Paama just to the south of Ambrym. On the way to/from Craig Cove of course, the plane flies over the whole island of Ambrym in around 9 minutes, and it flies somewhat closer to the volcanoes than you might expect. 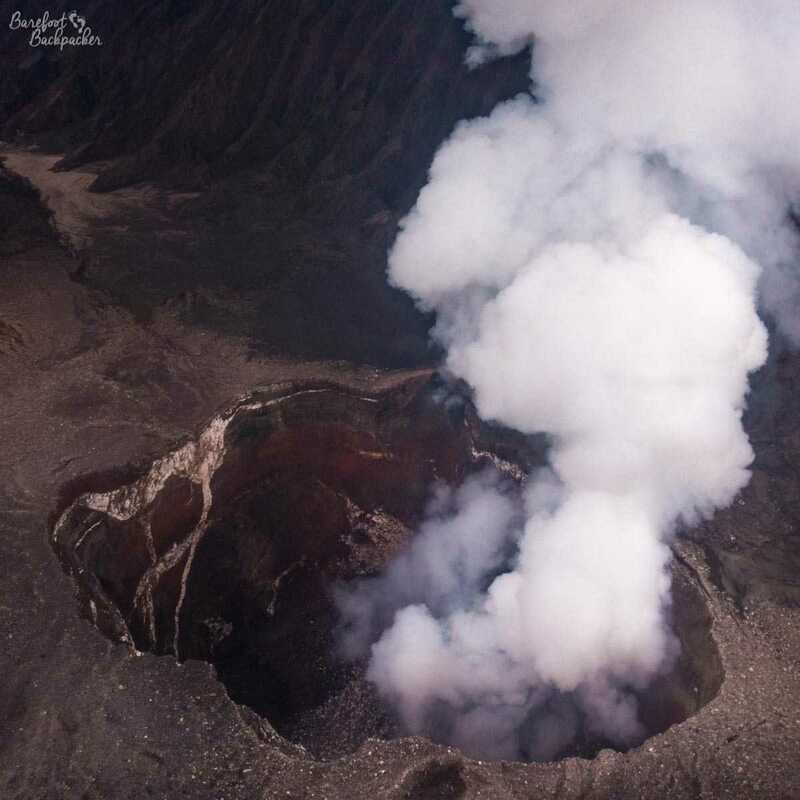 One of the best reasons to do the hike across the island is so you can take this flight and get a birds-eye view of the volcanoes that in other parts of the world would require an expensive helicopter charter. Note that I was flying westwards towards Craig Cove and sat on the right hand side of the plane; I don’t know if the route is the same but serendipitously that got me the best views. Ulei Airport. Yes I’m standing on a runway! Mount Benbow, as seen from the plane from Ulei to Craig Cove. In summary, it’s not an easy trek, but then I knew it was never going to be. 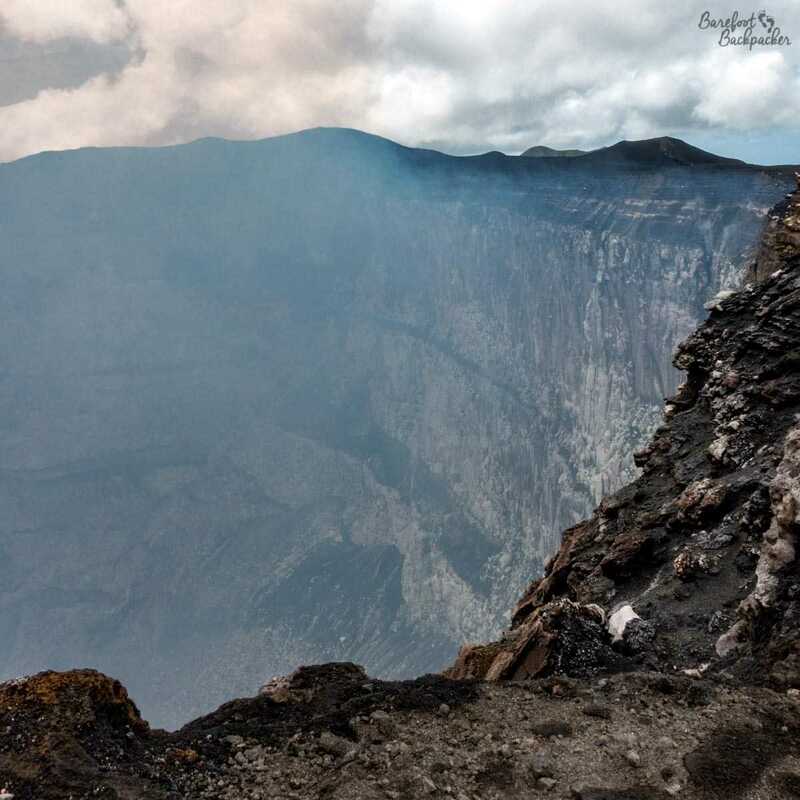 The treks I did on Malekula and Gaua were good introductions so I’m glad I did this one last – it was certainly the most spectacular and, while I’d now seen a volcano on Gaua, these were in a very different league. This was the reason I came to Vanuatu in the first place, and it was definitely worth it. For a more general overview, I recorded an entire podcast on Vanuatu. Give it a listen! My visit to Ambrym was between 7-12 August 2018. I booked through the Malampa Tourist Office of the Vanuatu Tourist Board, but I paid for everything myself so … I don’t know what else to tell you!